Lymphoma, the most common category of blood cancer, has two main forms: Hodgkin’s lymphoma (HL) and non-Hodgkin’s lymphoma (NHL). There are six types of Hodgkin’s lymphoma, but some 85 percent of diagnosed lymphoma cases are NHL. Both are cancers of the lymphatic system. The average American has a 1-in-50 chance of developing non-Hodgkin’s lymphoma in their lifetime, according to the American Cancer Society. Chemotherapy, radiation therapy, or a combination of the two are typically used to treat Hodgkin’s lymphoma. Bone marrow or stem cell transplantation may also be an option. Most patients with Hodgkin’s lymphoma live long and healthy lives following successful treatment. People treated for non-Hodgkin’s lymphoma generally will receive some form of chemotherapy, radiation therapy, biologic therapy, or a combination all three. Bone marrow or stem cell transplants may also sometimes be used, as may surgery under special circumstances. Although 30 to 60 percent of patients with an aggressive form of non-Hodgkin’s lymphoma can be cured, so-called “indolent” forms of non-Hodgkin’s lymphoma, such as follicular lymphoma (FL) are not currently curable, although the prognosis is still very good, with many patients living 20 years or more following an initial diagnosis. Over time, some patients with FL may eventually develop a transformed lymphoma, which is often more aggressive and usually requires more intensive types of treatment. Response to a treatment can also change over time, rendering treatments that worked initially becoming ineffective. Researchers encourage patients to keep abreast of the latest information regarding new or experimental treatment options and clinical trials. In more advanced stages of FL, physicians may use one or more chemotherapy drugs or the monoclonal antibody rituximab (Rituxan), alone or in combination with other agents. Monoclonal antibodies can act more directly than chemotherapy agents by targeting particular markers found in tumor cells and recruiting immune cells to promote the destruction of tumors, which can increase a patient’s response to treatment. Another treatment sometimes used for FL is ibritumomab tiuxetan (Zevalin), which is a radioactive particle connected to an antibody that targets cancer cells. The U.S. Food and Drug Administration has granted idelalisib (Zydelig) accelerated approval to treat patients with relapsed follicular B-cell NHL, as well as small lymphocytic lymphoma and chronic lymphocytic leukemia. Idelalisib is a phosphoinositide 3-kinase (PI3K) delta inhibitor that blocks cell signals known to be highly active in tumor cells and needed for growth and survival of those cells. For some patients with relapsed FL, high-dose chemotherapy and stem cell transplantation may be an option. 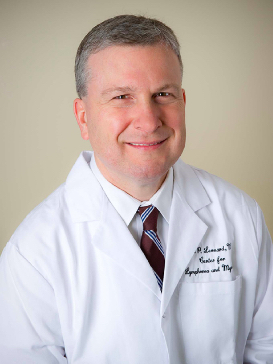 According to Dr. John Leonard, M.D., the Richard T. Silver Distinguished Professor of Hematology and Medical Oncology at the Weill Cornell Medical Center’s Sandra and Edward Meyer Cancer Center and Presbyterian Hospital New York, despite the fact that median overall FL survival exceeds 10 years, roughly 15 to 20 percent of patients with newly diagnosed follicular lymphoma have a rapidly evolving, progressive form of the disease that results in death within two to three years. 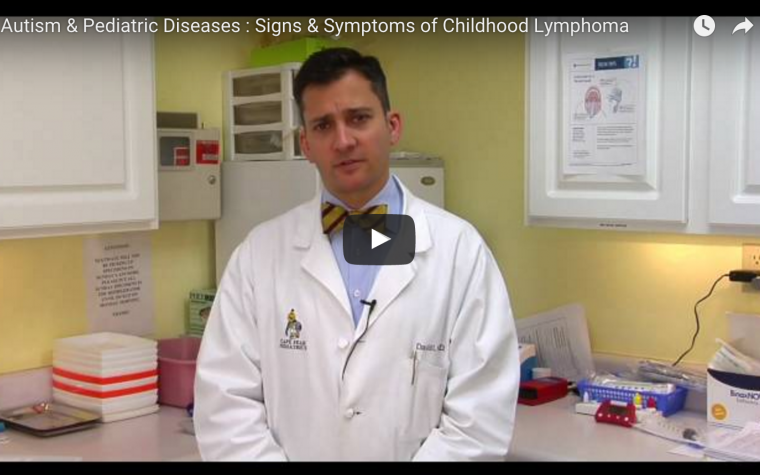 Leonard covered the topic recently as part of a new series of videos he is producing with other physicians and researchers in the Weill Lymphoma Program to shed light on research relevant to lymphoma patients. The REDLAMP — Review of Emerging Data for Lymphoma Patients — podcast features brief faculty reviews, presented in an informal, understandable way. Episode 2 includes a discussion of a study about the characteristics, treatment, prognosis, outcomes and mortality in elderly follicular lymphoma patients. In his new REDLAMP 13 video, “How Are Outcomes Improving for Patients with Transformed Follicular Lymphoma?” Leonard notes that diagnosis for follicular lymphoma that has transformed into diffuse large B-cell lymphoma (DLBCL) has in the past been associated with a poor prognosis for patients, and that in a National LymphoCare Study recently published in the journal Blood, researchers assessed the incidence, prognostic features, and outcomes associated with the transformation of follicular lymphoma in enrolled patients. 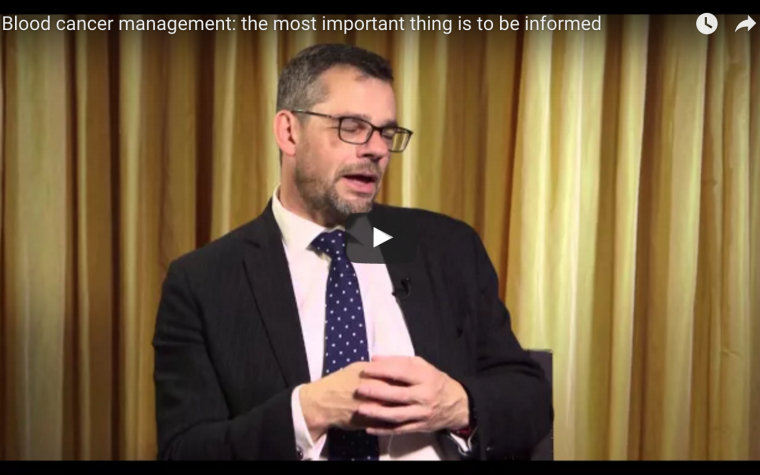 In this video, Leonard discusses the findings of the study — specifically, new data on outcomes based on novel approaches and therapies for patients whose follicular lymphoma has transformed. According to the National Institutes of Health U.S. National Library of Medicine, standard FL treatment options include single-agent rituximab (Rituxan) either alone or with other medications. Another drug, lenalidomide, is an immunomodulatory drug (which means it affects the immune system) that alters the body’s immune system and may also interfere with development of tiny blood vessels involved in tumor growth, thereby potentially reducing or preventing the growth of cancer cells. Lenalidomide has also been shown to restore the immune cells’ ability to attack and kill tumor cells, an ability that may be inhibited by follicular lymphoma and other lymphomas. The combination of rituximab and lenalidomide may eliminate the cancer while restoring the immune system’s ability to attack tumor cells. Ibrutinib is used to treat people with mantle cell lymphoma (MCL; a fast-growing cancer that begins in the cells of the immune system) who have already been treated with at least one other chemotherapy medication. It is also used to treat people with chronic lymphocytic leukemia (CLL; a type of cancer that begins in the white blood cells) who have already been treated with at least one other chemotherapy medication or who have a specific genetic risk factor. Leonard is a senior co-author of a recent study reported in the Journal of Clinical Oncology titled “Randomized Trial of Lenalidomide Alone Versus Lenalidomide Plus Rituximab in Patients With Recurrent Follicular Lymphoma: CALGB 50401 (Alliance),” which notes that lenalidomide and rituximab are active agents in follicular lymphoma, but combination regimens have not been previously assessed in randomized studies. The Cancer and Leukemia Group B (Alliance) 50401 trial was a randomized Phase 2 trial studying rituximab (375 mg/m(2) weekly for four weeks) and lenalidomide (15 mg per day on days 1 to 21, followed by 7 days of rest, in cycle 1 and then 20 mg per day on days 1 to 21, followed by 7 days of rest, in cycles 2 to 12), or LR. The authors report that the rituximab-alone arm was discontinued as a result of poor accrual. Ninety-one patients received treatment. The investigators conclude based on the study data that while LR is more active than lenalidomide alone in recurrent FL with similar toxicity, further study in B-cell non-Hodgkin’s lymphoma as a platform for addition of novel agents is warranted. An ongoing National Cancer Institute (NCI) Phase 1 clinical trial titled “Rituximab, Lenalidomide, and Ibrutinib in Treating Patients With Previously Untreated Stage II-IV Follicular Lymphoma” is studying the side effects and best dose of lenalidomide and ibrutinib when given together with rituximab in treating patients with previously untreated stage II-IV follicular lymphoma. It is believed that lenalidomide may stimulate the immune system in different ways and stop cancer cells from growing, while ibrutinib may stop the growth of cancer cells by blocking some of the enzymes needed for cell growth. Monoclonal antibodies, such as rituximab, can find cancer cells and help kill them. Researchers theorize that giving lenalidomide and ibrutinib together with rituximab may work well in treating follicular lymphoma. Tagged follicular lymphoma, ibritumomab tiuxetan, idelalisib, REDLAMP, Rituxan, rituximab, Zevalin, Zydelig. No words can describe the benefit- and hope, that this well-written article brings to me, a low-grade follicular lymphoma fella. Thank you, Charles Moore. Thank you for the comment! We are glad that you were able to gain some encouragement and hope from this article. Till date thousands of visitors have been successfully treated, and are leading a healthy life with the help of “Detox of South Florida”. The main advantage of detoxifying is that it can help protect you from disease and help you to maintain optimum health and immunity to fight any infections. Here you find expert professionals with all latest equipments and advanced methods used to treat the patients. Just a point about FL transformation. Should you be unfortunate to transform you would be best served to have not been treated with CHOP prior to transformation. Thank you Glen for stopping by and sharing that information with us.